What is facial palsy and how is it treated? 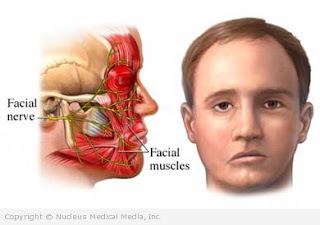 Facial paresis is the inflammation of the nerves in the face that causes paralysis of the face. Facial nerve is the seventh brain nerve that innervates the mimic muscles (a collection of it are in the forehead, closing the eyes, mouth), the front two thirds of the tongue, the lacrimal gland, the external auditory canal and middle ear, which precisely, regulates motor skills and appearance of the face, hearing aid and processes food. This disease can occur at any age and attacks both men and women, a cure is possible in most cases already after two to three months, while in the elderly it takes two years to fully heal. In a small number of people there are consequences in the form of permanent weakness in that part of face affected by inflammation, but also twitches of facial muscles can occur. Below find out what is facial weakness, what are the symptoms, causes and what treatment is recommended. Facial palsy manifests weakness of the half of face and often precedes the pain in the ear, which occurs a few days earlier. The first symptoms of paralysis occur acutely - brow is slightly lowered, the patient can not completely frown (on one side of his forehead to see clear furrows and wrinkles, while the other does not), lower eyelid hangs, eyeball rotates upward, tears are present. The lip on the affected side is relaxed and gives the impression of the viewer as if hanging, there is a confluence of saliva, food accumulates between the cheeks and gum, while here is some loss of taste. Facial palsy is often caused by a cold or prolonged exposure to cold air flow (sitting next to an open window in a car or train, sometimes these are viruses (herpes simplex, herpes zoster), bacteria (challengers otitis media), as well as tumours, stroke and head injury and the most common form of facial paralysis is known as Bell's facial palsy whose origins are still unknown to this day. Facial palsy first has to be properly diagnosed only by an experts. Diagnosis is based on history, a patient undergoes neurological, ophthalmological and other tests, after which an appropriate therapy is prescribed. Inflammation of a nerves in the face is primarily an aesthetic problem, but if symptoms persist, stress can arise and many other mental problems also, so it is important that the treatment is carried out in time, because the complete recovery will happen in a much shorter time. Depending on what stage facial palsy is, the treatment can be hormonal, and in severe cases resorts to surgical procedures - which is quite rare. In most cases, recommended is physical therapy - electrical stimulation and exercise. Electro influence of each muscle individually, and the process continues until the processing of all the muscles in which it may elicit a response, after which the procedure is repeated. Kinesitherapy is trying to preserve and increase the elasticity of the soft tissues of the face and the goal is to strengthen the weakened muscles with some face exercises. In addition, applied is local thermotherapy - the application of warm compresses in front of the ear. In addition to these methods, doctors also suggest that the facial nerve is sure to be warmed when you are at home. It is famous and popular recipe to warm a tile, which is then wrapped in tea towels, and put on part that facial palsy affected. They are very effective and gentle massage of the face from the corner of the mouth to the ear, this exercise returns functionality to a seized lid which is affected by facial palsy. The advice is also to have a gauze and cover your face to prevent hair of getting in a way but also to protect the cornea from dust and temperature extremes. For relaxation of the facial muscles, it is advisable to use this effective recipe: cook ginger tea, and wait for it to cool a little. Prepare a gauze and dip it in warm liquid, and put it on the affected side of the face to rest for about 10 minutes. Pour a few drops of essential oils of lavender or peppermint on the palms and apply on the face, around the place where the inflamed facial nerve is. With measured movements stretch and relax the facial muscles. Prepare 2 small teaspoons of minced peppers, and let it sit for five minutes in 250 ml of boiling water. Prepare a towel, dip it in liquid, squeeze and tighten the affected side of his face. Mix 10 g of aloe leaves, 10 g of acacia flower, 10 g of cinnamon, bay leaf, 10 g of fenugreek or roots of rhubarb, 10 g of gentian root, white ash, crushed juniper berries and angelica root, 5 g of fairy sieve and resins of fir, 4 g of fennel or anise and 0.2 g of pistils of saffron and iris root, 4 g of fennel or anise, 5 g of fairy sieve. Mixture put into a 2-liter bottle with a wide spout, pour 1.5 litres of 40% vodka, close and leave in the sun or in a warm room for 14 days with daily shaking. The fifteenth day, strain the contents of the bottle, a tincture is kept in a closed, glass bottles in a cool place. Before use, shake, prepare a towel, soak it in warm water and squeeze. Then soak it in the Swedish tincture, put on the affected area and hold for 4-6 hours. Facial palsy requires a specific diet based on meals of fresh vegetables and fruits, along with natural squeezed juices, salad with nettle and dandelion and unavoidable herbal teas.